We talked about ambition one day in the car, and Zaria said she’s undecided on what she wanted to be when she grew up. A vet dentist (yeah, one who will extract tooth for crocodiles) or a florist. I casually said she’ll need a rich husband to be a florist, as there’s not much income to be made, since not many people give or get flowers these days. I’m the best example! I’d never received flowers from anyone nor the hubs except the time when I had my miscarriage many years ago where I got a bouquet from my Singapore boss who couldn’t visit me personally. Back home, I thought it’ll be a good topic to write about, so I asked Zaria to write “Weird habits people have.” She was not very happy I asked her to write, but she knew she had to do it or she won’t get to watch TV nor have a go at the iPad. 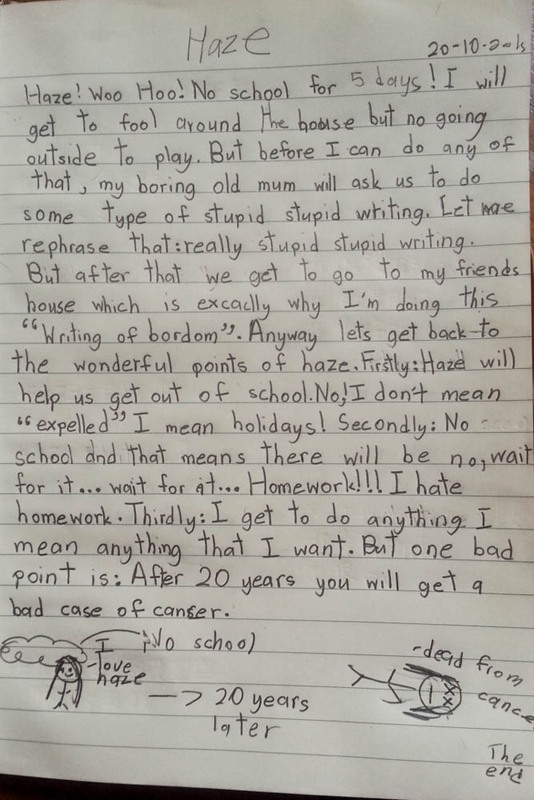 So this is what she wrote (horrid writing because she’s extremely unhappy with the assignment). Can you make up what she wrote?